This pallet scale PCE-EP 1500 allows you to weigh load directly in the ramp. This model of pallet scale is the ideal solution for the fast and precise mobile weighing in industrial sector and warehouses, while shipping and receiving and in inventory control. Now, you don't need to move the pallet up to the scale. You only have to bring the scale close to the merchandise to weigh, and you will be able to have a good control of the process. The pallet scale is transported without problems. In the front view you have a handle to elevate it and on the sides of the scale there are wheels. 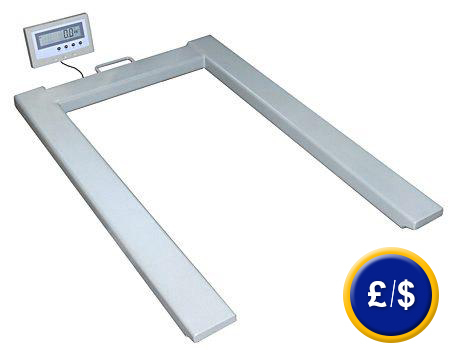 The display is mounted on the back part of the pallet scale (ideal for its transportation), nevertheless you can remove it and place it where you want. This link shows an overview of the scales and balances which will meet your requirements. The calibration procedure includes laboratory calibration process and ISO certification. The customer's name and addres are included. These certificates are comparable to NIST and UKAS certificates. They are accepted all over the world. In case your PC or Portable uses USB-Interface, you can use the adapter together with the standard RS - 232 Cable. Software (covering the actual drivers) is included. 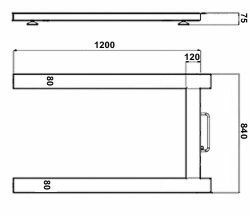 The printer is used for direct output of weighing data. It will be delivered with RS-232 cable and net adaptor.